March 1 – April 13th at The Library|MAIN: Discover the story of the book through The Traveling History of the Book Exhibit created as a result of the creative collaboration between the Iowa Center for the Book and the University of Iowa Center for the Book. The Richardson-Sloane Special Collections Center hosts this “hands-on” exhibit showcasing historically accurate replicas of the book throughout history. Learn about a rosetta stone replica, papyrus book, miniature books, and more by visiting this booktastic exhibit! The project is funded by a major grant from the Iowa Center for the Book Foundation. April 9, 2019 at St. Ambrose University Rogalski Center Ballrooms 2-4 from 7-9:00 p.m.“Becoming American: Our Immigration Experience Past and Present.” The series is sponsored by the Jewish Federation of the Quad Cities, the Moline Public Library, the German American Heritage Center, the Butterworth Center, St. Ambrose University and Augustana College. Viewing and discussing the film “Immigration and Popular Culture” Media and popular culture have historically taught new citizens how to be :American,” and different immigrant groups have transformed American culture and art, film to music to food. April 10th: The Library|MAIN at 4:30 p.m. Books: Learning Through Handling Learn about books through handling and examining “the book” as a physical object. April 13th: Willkommen Kaiserslautern! FREE Open House at German American Heritage Center 6-8PM. Davenport Sister Cities & The German American Heritage Center invite YOU to meet and greet the delegation from Davenport’s longest running Sister-city during the kick-off to 60 years in 2020! April 28th: Genealogy Party at Richardson-Sloane Special Collections Center The Library|MAIN 3-9:00 p.m. Details to follow! Call 563.326.7902 to reserve your spot for food, fun and friendly family finding! 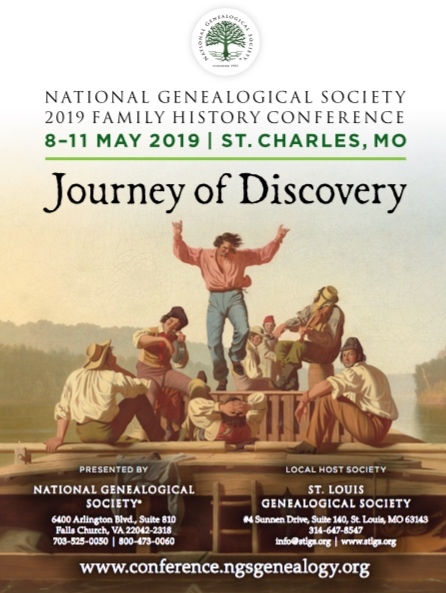 The National Genealogical Society’s 2019 conference includes more than 150 unique lectures on topics such as vital records and religious records, migration and immigration, U.S. census and military records, land records and maps, court records, ethnic resources, government documents, using DNA testing, technology for genealogy, Midwest regional topics, and much more. Conference registration begins Dec. 1, 2018 – you can also register for workshops, tours, meals, and other special conference events. Every conference attendee receives a digital syllabus of more than 600 pages that includes each handout provided for every lecture. There are a number of Conference Hotels and reservations are now being taken! For more info on the conference, registration, and conference hotels, click HERE. I lived in Davenport until I was 4 years old and am now getting into genealogy. Is there a society homepage? All I see are the “events” listing. The Scott County Iowa Genealogy Society does not have a website at this time. However, you may contact them via e-mail (scigscorsec@yahoo.com) or regular mail (P.O. Box 3132, Davenport, Iowa 52808-3132). i am researching my families ancesters, and have knowledge of my great great grandparents settling in davenport; and living at 1025 west 5th st. their name was franz and maria bruggemann.their daughter (my great grandmother)was born at that address. i am looking for any information you may have as to when they settled in davenport. If you could please fill our our online research request form on our website (www.qcmemory.org/Page/Ask_a_Question.aspx?nt=208), with any general dates you might have for this family, we will see what our resources can do for you! I am looking for any information about my Grandmother, Ida Roneau (?Spelling) who was born in Hamburg, Germany on March 25, 1860. She immigrated to the US in 1879 or 1880 and joined her sister in Davenport, Iowa. She married Wilhelm Peters(born 28Aug1880) soon after her arrival and they lived in Dysart, Tama County Iowa. I have not been able to find any information about her prior to her marriage to Wilhelm. If someone could look for any information in Davenport with anyone with that name I would be happy to pay for any information about her or her sister. Unfortunately, I do not know her sisters name or whether or not she was married. thanks, Helen Peters. We ask that our blog followers please send all research requests through our website (http://www.davenportlibrary.com/genealogy-and-history/ask-a-genealogy-question) or through e-mail (specialcollections@davenportlibrary.com). This year I began a FB page where I’m posting my grandfather’s diary entries from 1915. At that time he was 18 years old, living in Davenport with his sister and mother. He was a student at Palmer School of Chiropractic. I thought you might find it interesting. His name was Earl Benton. His sister was Rosybell Benton and his mother Rosy Leaf Benton.